Somehow time has just shot by in recent weeks and I realised (yet again) that it’s been far too long since the last blog update was posted. However, even though the updates have been few and far between, that doesn’t mean nothing has happened. The biggest topic over recent weeks has been the pigs with those we kept for meat going off to slaughter in 3 batches during the summer and autumn. We raised a total of 7 meat pigs from the two litters this year but we also sold another 9 piglets as weaners to other people. Our first batch of 2 pigs went in August and I was pleasantly surprised to find that nearly all the pork sold out fairly quickly. The second batch was also 2 pigs that went off in October and again we found that the vast majority of the pork sold very quickly. So eventually we get to the final batch (3 pigs this time) which went off to slaughter last week and the pork is now with the local village butcher for cutting/packing. 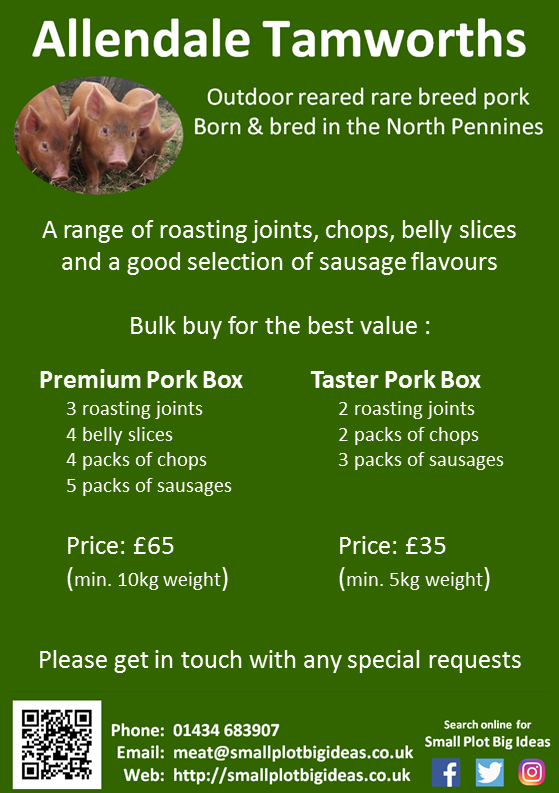 Luckily we have a number of very happy customers who have placed second (or third) orders and all the feedback has been positive with the roasting joints (and crackling) coming in for some special mentions. I checked out rhubarb in the cloud and find you are growing this ..which I remember eating with Birds custard in my far-off youth. Happy memories. P.S. I get up as early as a farmer here….the best hours of the day are 5 – 9 a.m.